Champagne is known to be an item of luxury, set to enjoy in upscale settings and special events. 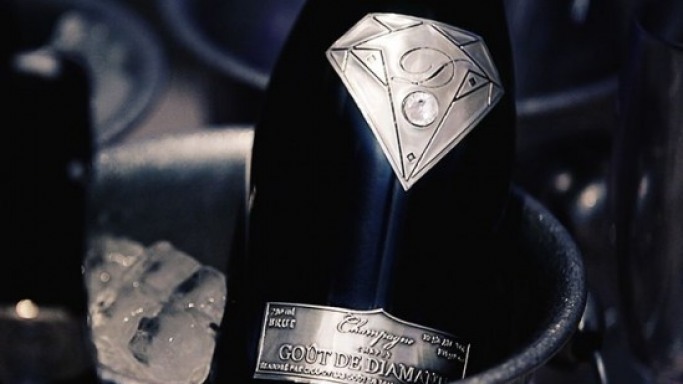 Gout de Diamants is a brand that exudes luxury, as the name translate to “taste of diamonds” in other words high-end taste. The creator of the brand is of Nigerian descent; which is fitting as Nigeria is the second largest champagne consumer in the world, spending an average of 30 million on champagne per year. This is not the first time this prestigious brand has created a specialized bottle for a particular client. This time the brand has gone above and beyond by creating the most expensive bottle of champagne ever sold. What makes this bottle so expensive you ask? Well they have taken their signature Superman badge logo typically made of Swarovski Crystal and upgraded the material to 18-carat solid white gold centered by a single, flawless deep-cut white diamond weighing 19 carats. With a price tag of $1.2million this bottle has set a record even for the brand that sells bottles of champagne for $250,000 each. Inside the bottle can be found the brands signature ingredients of “Grand Cru Chardonnay, Pinot Noir and Pinot Meunier that offers a floral, refreshing and creamy texture and ends with a light and elegant finish,” says the champagne maker.